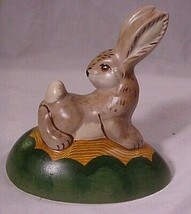 Vaillancourt Folk Art Bunny Looking Back, no. 2006 - 07 - 2006 - # 26. A very cute Bunny in a great pose looking over his shoulder. It measures 6 inches and is in perfect condition. Wonderfully Painted by the Artists of Vaillancourt Folk Art of Sutton Mass, made in the USA. Personally signed by Judi Vaillancourt who does the design of all the pieces that are later created by her artists in editions. Made from Antique Chocolate Moulds in chalk ware and later painted beautifully. Email zip code for shipping.AS ALWAYS YOUR SATISFACTION IS 100% GUARANTEED!